Columbus now stores the start and end location of CVS/GPX tracks to disk after the track has been opened for the first time. The locations are stored in what we will call “location cache”, from now on. The main advantage of the location cache is the possibility of browsing and looking for tracks by location in an efficient manner. This is done with the new “Browse Directory” command. Start and end location is shown for those tracks whose locations have been stored in the location cache (that is, for those tracks which have been opened at least once). 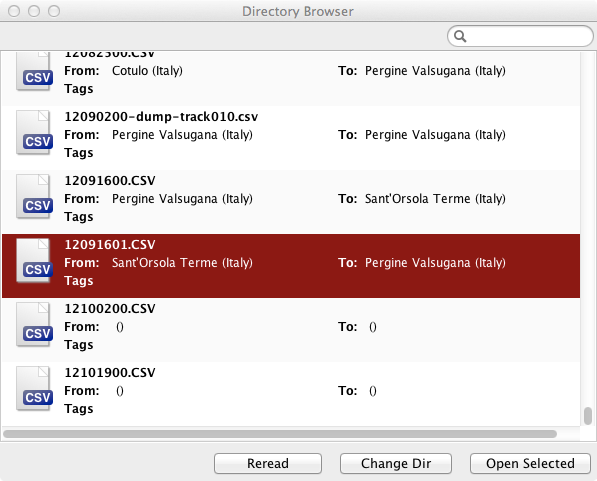 The browser allows to filter tracks by location name and to open them in the viewer. If you keep all your tracks in the same directory (for instance “~/GPS”), the directory browser is an efficient tool to look for tracks. Just make sure you open all your tracks at least once in the viewer (so that start and end location can be retrieved from the Internet) and the location cache will do the rest. 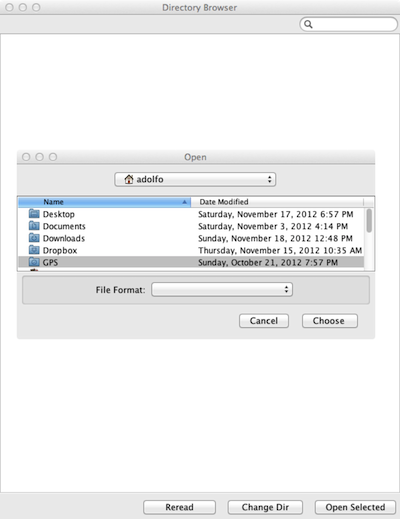 moving a file from one directory to another does not affect the information stored in the directory browser. The information about start and end location is stored in the Library/Preferences/com.minimalbit.ColumbusMetaData.serialization file. Columbus now logs queries and access to the location cache to files which are stored in the Library/Logs directory (the files are called ColumbusLogs.log.N).